Kakteen Sukk. 55(1): 13 (-14). 2004 [Jan 2004] nom. inval. Contrary to Art. 33.4 ICBN (2006); see Art. 33.4 Note 1. Altitude: 2800-3450 metres above sea level. Habitat and Ecology: The species occurs in pre-Puna and on rocky lands within shrubby vegetation in seasonally dry inter-Andean valleys. It grows together together with Parodia schwebsiana v. applanata. 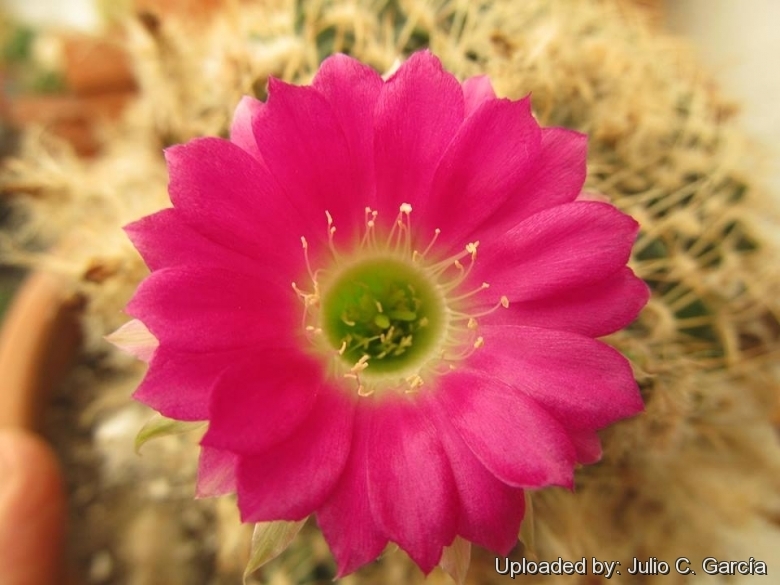 Description: Echinopsis oligotricha (syn: Lobivia cinnabarina subvar. oligotricha) is similar in habit to Echinopsis cinnabarina var. acanthoplegma but the flowers tube are typically nearly naked (or with few hairs). It is a small plant with flattened stem, but worth growing for the fantastic pink-violet to red flowers with a contrasting white throat. As most Libivias it is easy to grow and ready flowering plant. Habit: It is a small, low growing cactus that grows usually solitary (unless damaged). Stem: Green, spherical-flattened to spherical, 15 cm diameter. Ribs: Approx 26 with noticeable tubercles up to 15 mm long. Radial spines: Approx. 10, up to 20 mm long, awl-like, lying flat to the body, more or less interlaced. Flower: Arising from the basal tubercles on the side of the plant, up to 5 cm long and in diameter, unscented, pink-violet to red, throat usually lighter or white. Fruit: Globose to oval, semi-dry and perpendicularly splitting. Seed: Spherical, rough, grey, covered with skin remainders. Echinopsis cinnabarina (Hook.) Labour. : has a flattened usually solitary body with spirally arranged ribs, with raised to acute tubercles. Spines arranged like little spiders. Flowers apical, scarlet to deep red. Distribution: Southern Bolivia and Northern Argentina. Echinopsis cinnabarina var. acanthoplegma (Backeb.) G.D.Rowley: has colourful flower flowers ranging from orange to dark violet-red with contrasting white throat. Distribution: Cochabamba to La Paz , Bolivia. Echinopsis cinnabarina f. variegata hort. : Variegated form. Echinopsis oligotricha (Cárdenas) M.Lowry: is similar in habit to var. acanthoplegma but the flowers tube are typically nearly naked (or with few hairs). Distribution: Arani, Chochabamba, Bolivia. Lobivia acanthoplegma var. patula Rausch: has more porrect-spreading spines than the var. acanthoplegma. Distribution: Cliza and adjacent areas, Cochabamba, Bolivia. Lobivia acanthoplegma f. pilosa Rausch: has dense hairy dark carmine flowers up to 50 mm large. Stem single globose with dense yellowish spines, crown slightly depressed. Distribution: Cerro Kara-Kara, Cochabamba. Lobivia cinnabarina var. draxleriana (Rausch) Rausch: has a very flat body, and paler creamy-yellow spines. Distribution: Cochabamba and Chuquisaca. Lobivia cinnabarina var. walterspielii (Boed.) Rausch: has a very flat body, longer and more porrect yellowish spines and clear red cup-shaped flower. Distribution: Potosi, between Otuyo and Betanzos. 5) Walter Rausch "Lobivia 85." Rudolf Herzig Verlag, Wien. 1986. 8) Lowry, M. 2013. Echinopsis cinnabarina. In: IUCN 2013. IUCN Red List of Threatened Species. Version 2013.2. <www.iucnredlist.org>. Downloaded on 12 January 2014. Cultivation and Propagation: Echinopsis oligotricha is a summer grower species that offers no cultivation difficulties. Water regularly in summer (but do not overwater ) needs good drainage and very porous, keep rather dry in winter. Feed with a high potassium fertilizer in summer. It is quite frost resistant if kept dry (hardy to -12° C). Need a bright exposure, full sun or half shade in summer. Propagation: Direct sow after last frost, offsets (if available).